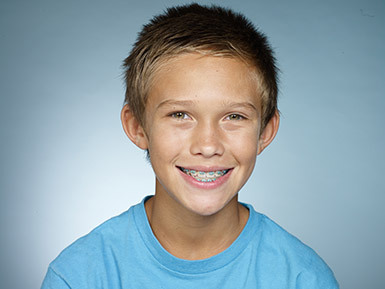 At what age should a child first visit with an orthodontist? Dr. Tsintolas and The American Association of Orthodontists encourage a first visit to the orthodontist by age 7, earlier if there is a particular concern. Parents can feel good about consulting with Dr. Tsintolas for their child’s orthodontic care even if the parent perceives the child too young. Dr. Tsintolas provides an honest assessment of your child’s current and future orthodontic needs. If the best plan is to wait and afford your child more time for tooth eruption and jaw growth, Dr. Tsintolas suggests your child return to the office for periodic monitoring at no charge. The doctor evaluates your child at the prescribed intervals and he reviews and updates the orthodontic plan. Some children remain under Dr. Tsintolas' watchful eye for years until the timing is optimal for orthodontic care. Rest assured, the doctor's priority is the individual patient and he will not recommend unnecessary treatment nor will he push treatment earlier than optimal. While some children are not developmentally prepared for orthodontic care, others present to the consultation ready to benefit from treatment. Dr. Tsintolas explains the need for orthodontics and the prescribed plan for care. He supports the parent(s) through the decision making process. The American Association of Orthodontists has prepared a very brief and helpful document on this topic. The Right Time for an Orthodontic Check-Up and Problems to Watch For. An orthodontist is a specialist and receives years of dedicated training upon completion of dental school. The orthodontist marries the alignment of the teeth and jaws with proper function and facial esthetics for all patients in his care. It is very important to recognize that dentists do not have the specialty training of an orthodontist. While dentists may offer some orthodontic services, orthodontists have expertise in a full spectrum of specialty orthodontics services. The American Association of Orthodontists has prepared a concise, one page description of an orthodontist, What is an Orthodontist? Is it a wise strategy to postpone orthodontic care until my child is 13 or all permanent teeth are present? Delaying orthodontic care until age 13 or until all the permanent teeth are present is a common misconception. Sometimes, the dentist reinforces this notion. Many treatment options are effective only while a child is actively growing. As a child matures, growth slows. Waiting too long can limit the orthodontic treatment possibilities and adversely impact the outcome of treatment. The best plan is to seek an orthodontic consultation no later than age 7. Dr. Tsintolas will evaluate the individual needs of each child and conclude if and when orthodontic treatment is advisable. Recommended treatment will be timed to achieve the greatest benefit. How much does orthodontic care cost? On one end of the orthodontic spectrum is focused, minimal treatment that necessitates just a few months in treatment. Individuals who are best served with a multi-phase approach populate the other end of the spectrum. Most patients’ care falls somewhere in between. The variation in treatment is extensive. Orthodontic fees reflect the planned treatment. Fortunately, obtaining an accurate fee quote for your specific orthodontic care is easy. Please schedule an orthodontic consultation with Dr. Tsintolas. The doctor will devote time to a thorough examination after which he will discuss the course of recommended care, treatment options, and the associated fees. Insurance and payment plans are part of this conversation. You will be provided with all the information you need to make an informed decision about orthodontic care. Dr. Tsintolas is available for assistance should questions arise after consultation. We regret that quotes cannot be offered over the phone due to the individual nature of each patient’s orthodontic treatment plan. I am an adult. Aren't braces just for kids? Orthodontics is for anyone who wishes to improve appearance and function, regardless of age. Ceramic (tooth colored) braces and Invisalign® are popular choices among adults. Arrange for an orthodontic consultation with Dr. Tsintolas to discuss the best options for you. To learn more, read the brief document by The American Association of Orthodontists, The AAO Recommends Treatment for Adults, When Appropriate, in Conjunction with Regular Dental Care. Test your knowledge of orthodontics AND learn interesting facts! The American Association of Orthodontists has produced a brief True or False.